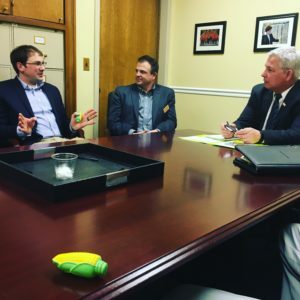 The New York Corn and Soybean Growers Association, Inc. is pleased to announce the call for nominations for the 2019 Board of Directors. The board seeks to elect the seats of three (3) regular Director positions whose terms will expire on 09/30/2018. The board also seeks to fill an additional vacant seat for a term set to expire on 09/30/2019. Directors shall be elected by the members of the Association by a majority vote at the September 13, 2018 Board of Directors meeting for a term of three (3) years, must be residents of New York and regular grower members of the New York Corn & Soybean Growers Association. All Directors must be at least twenty-four (24) years of age. Newly elected Directors will begin their terms effective October 1, 2018. The vacant seat will be filled by a candidate appointed by the board to fill out the remainder of the term. Service on the Board of Directors of the NYCSGA is a chance to help drive the decisions of the Association and the valuable work it conducts in research, promotion and education for the betterment of NYS commodities and the future success of our farmers. Board service also provides opportunities to develop valuable leadership skills in non-profit governance, program planning and strategic planning as well as the chance to expand your professional network, advocate for the industry and give back to the community. Nominations may be submitted to the Executive Director at PO BOX 133, Silver Springs, NY 14550 or by email at cklein@nycornsoy.com. Nominations are due back by July 15, 2018.